The war in Yemen and the role of the U.S.
Home > > The war in Yemen and the role of the U.S.
« Anti-War Committee 20th Anniversary Party! College of St. Benedict and St. John’s University. Saudi Arabia has been conducting a horrendous war on Yemen with U.S. support. Millions of people in Yemen face starvation. • What is behind this war? • What is the military and political role of the U.S.? 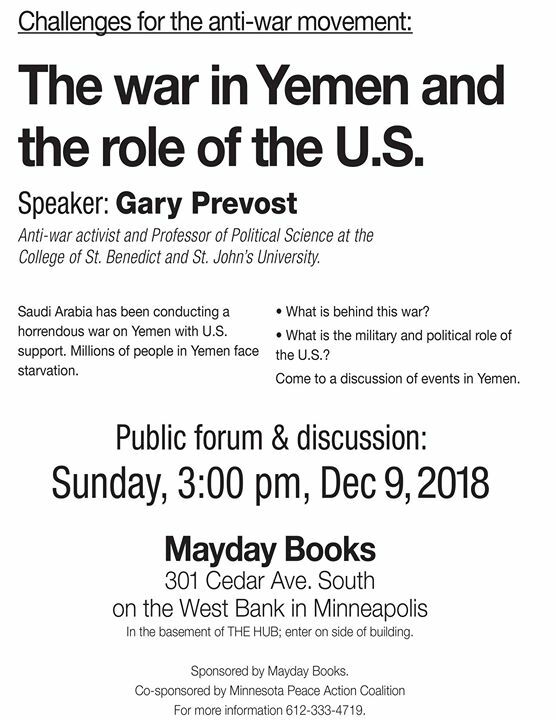 Come to a discussion of events in Yemen. In the basement of THE HUB; enter on side of building. Co-sponsored by Minnesota Peace Action Coalition.